Have you ever ordered a kale salad on a first date and tried to gracefully consume a meal of giant, wayward kale leaves? Awkward. Regretful. Ugh. I’m on a mission to change that. I won’t quit creating new kale salad recipes until we can all walk into a restaurant and consistently receive a great kale salad. Based on some recent experiences, I declare that my work here is far from done. 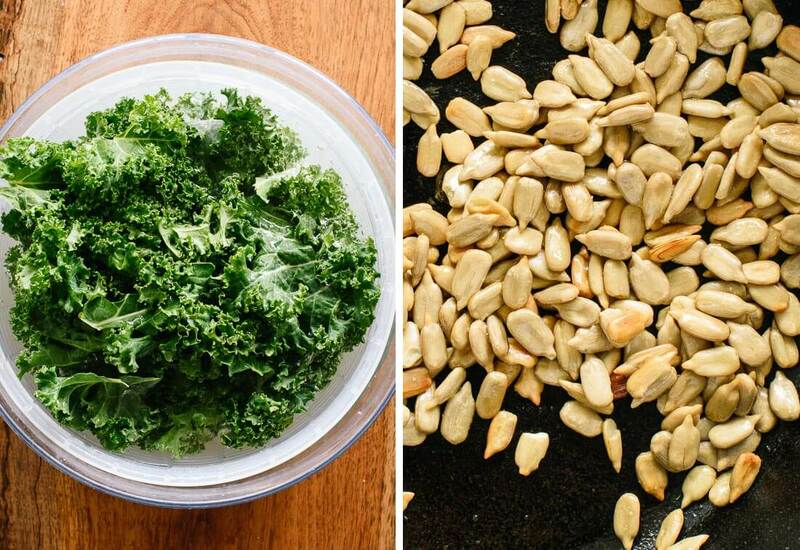 Here’s how to make a kale salad that’s better than those sad restaurant salads. First, remove those tough ribs from the kale, chop it into bite-sized pieces, and massage it to minimize the poky factor and improve the flavor. (Yes, massage it. I know it sounds ridiculous, but it’s worth it! See instructions below.) Drizzle in a bold salad dressing and toss until it’s completely coated (I always use more dressing on kale salads than other green salads). 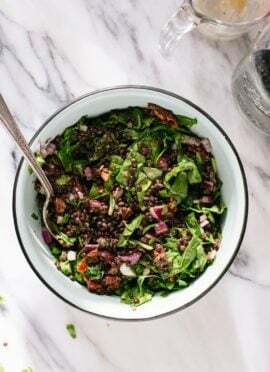 Add some fun flavors and textures and you will have yourself a great kale salad. I say all of this to defend kale salads against mentions that they’re “too trendy” or overdone. But kale salads, when made properly, can make truly delicious, crave-able meals. Those kinds of meals don’t go out of style. Right? 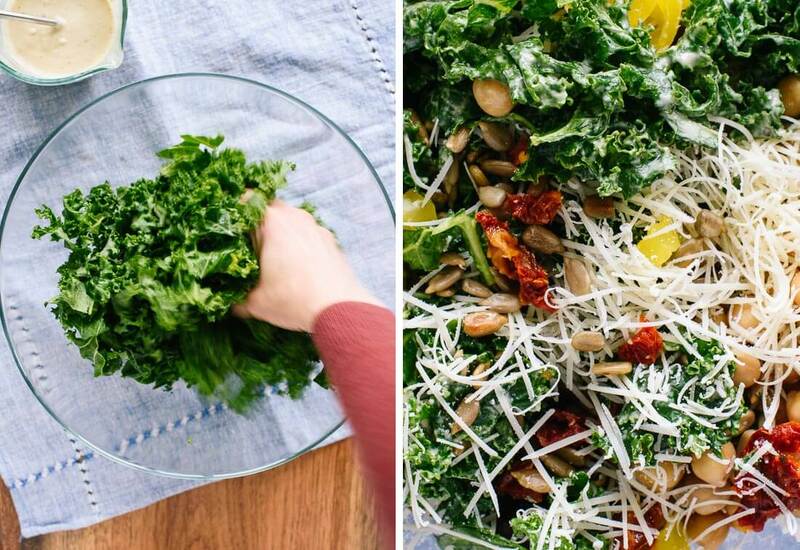 Let’s make kale salad a classic like pizza and mac and cheese. We’ll all be better off for it. This salad is the mac and cheese of kale salads, if you will. It’s creamy thanks to a bold tahini dressing, which makes this salad seem way more indulgent that it actually is. I packed in more flavor and texture with freshly toasted sunflower seeds and briny olives and pepper rings that I cannot resist. Chickpeas offer some protein and up the hearty factor. I’ve been craving heavy, cheesy comfort foods lately, but I legitimately can’t wait to get home and polish off this kale salad. I hope you feel the same! This healthy Greek kale salad recipe is full of bold Mediterranean flavors. It packs great for lunch, too. Recipe yields 2 large meal-sized servings, or 4 medium side salads. 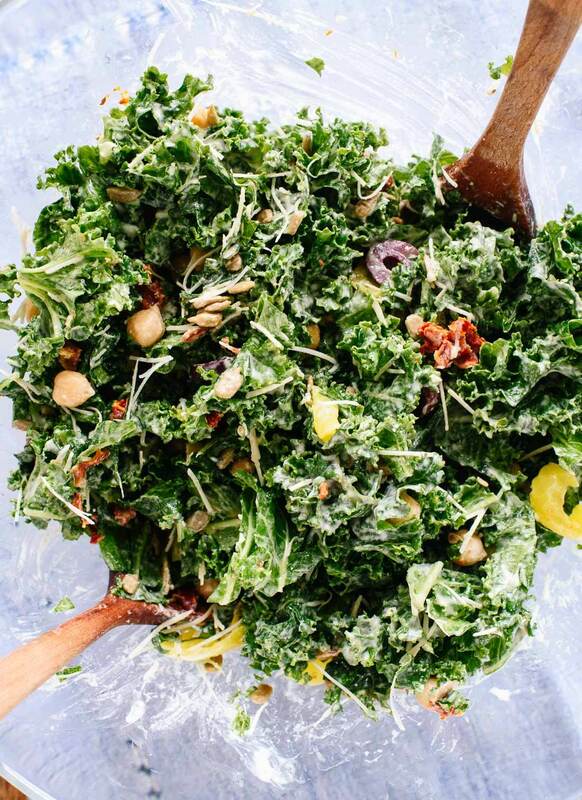 To prepare the salad: Place the chopped kale in a large serving bowl. Sprinkle it lightly with salt and massage it with your hands by scrunching up large handfuls at a time until it’s darker and more fragrant (this makes the kale more tasty and easier to eat). Add the chickpeas, olives and/or pepper rings, sun-dried tomatoes, and Parmesan (if using). Set aside. To toast the sunflower seeds, combine the seeds with the olive oil and a few dashes of salt in a small skillet over medium heat. Cook, stirring often, until the seeds are fragrant and turning lightly golden at the edges, about 5 minutes. Pour the toasted seeds into the salad bowl. To prepare the salad dressing: In a small liquid measuring cup or bowl, combine the tahini, olive oil, lemon juice, garlic, mustard, and salt. Whisk until blended. Add the water and whisk until blended. Season generously with freshly black pepper, to taste. Pour the dressing into the salad (you might not need quite all of it, but I did). Toss until the salad is evenly coated with dressing. Serve immediately. This salad keeps well in the refrigerator, covered, for up to 3 days. Make it dairy free/vegan: Omit the Parmesan. You might like a light sprinkle of nutritional yeast to make up for it. 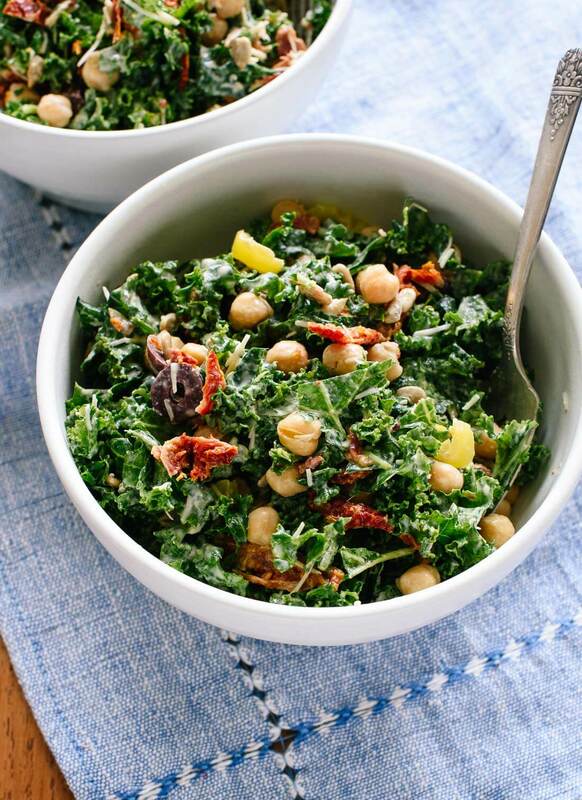 If you love this recipe: Check out more kale salads here. Mmhm! Let me know if you make it, Sara! Looks and sounds incredible! I totally get what you mean about raw kale salads – this one looks delicious though! Haha! I knew I was telling a universal truth with that one. Let me know if you make it, Rhian! This looks delicious! Do you have any recommendations for which brand of tahini to use, as there are so many choices, thanks. Hi Jerilyn, that’s a great point—my favorite by far is Whole Foods 365. I stock up when I’m at the store. Do you use vegetarian parmesan or vegan parmesan? I know Whole Foods has a vegetarian version of parmesan cheese that is decent, but there’s also a vegan version that really isn’t too bad now!! I haven’t heard about vegan Parmesan! I am generally wary of vegan cheese because they can be full of processed ingredients, but I’ve heard that Myoko Creamery came out with a good vegan mozzarella without those crazy ingredients. I have been meaning to find some. Anyway, I buy Whole Foods’ Parm or Bel Gioso’s vegetarian version. That looks so good. I’m on a cleanse right now, but I’ve already made a note of this & printed the recipe. Thank you. Let me know how it goes when you make it, Donna! Interesting! I’ll definitely compare the two techniques. This looks terrific. What’s a ‘pepper ring’? Oh! Let me clarify: I mean hot or mild pepper rings, like banana peppers, that come pickled in jars already sliced into “rings.” They pair really well with Kalamata olives. You should be able to find them near the olives at the store, or ask someone at the deli where you can find them. Love this! I make my own Tahini. I buy sesame seeds in bulk and whirl them together with grape seed oil. Bottled tahini can be costly and is sometimes not available at grocery stores. Plus it has a limited shelf life when you open a jar and keep it refrigerated. Thanks for the tip, Sherry! Recipe”) site. Thanks for letting me be part of your (and Cookie’s) adventure. Looking forward to that cookbook! Thank you so much, Theresa! Delighted to hear that you appreciate my recipes. Have a great day! 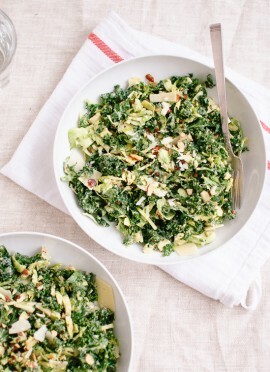 This salad sounds quite interesting – definitely not your average kale salad. I’m interested in trying it, but I have to balance that with my husband’s thinking that eating kale is strange. I think the massaging process might help with your husband’s misgivings – it makes the leaves less stiff and more palatable, and softens some of the bitterness in the leaves. Let me know if you end up making it! I love the concept of Tahini Dressing and haven’t met a Greek salad I didn’t like. I can’t wait to try this recipe. I never thought about massaging kale! But, I get it! 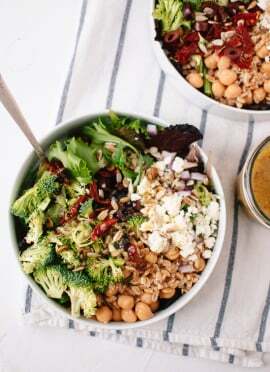 This salad and particularly the dressing looks amazing! I know, it seems a bit weird at first, but it helps to make the leaves a bit more malleable and less bitter so you don’t have to fight them getting into your mouth (never a good look). Let me know how it works out for you! Ugh, I wish I could ban that from ever happening, but ads are served up to each user differently so it’s like playing whack-a-mole. What a coincidence! I’ve been making almost this exact recipe for the past 2 years. It’s such a great blend of flavors. Yes, I’m really loving this for lunch this week! 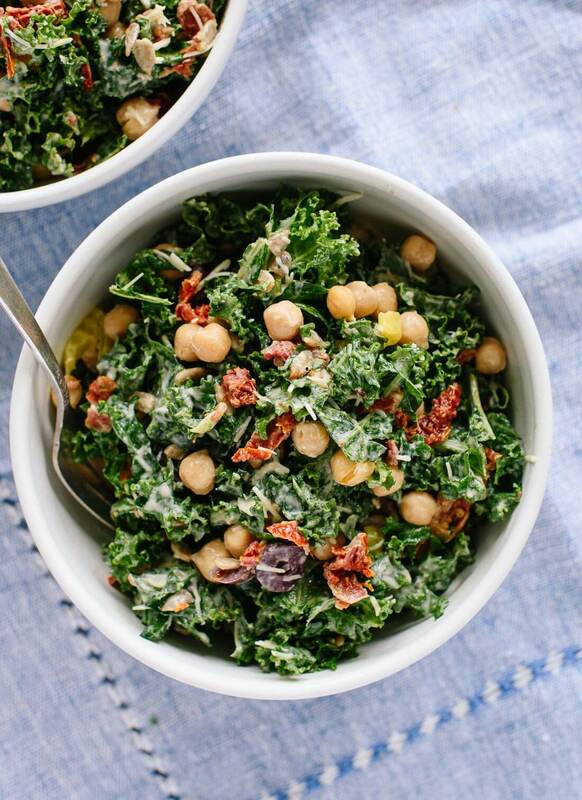 Kale salads are trendy for a reason….they rock! And I’m so into this tahini dressing. I can’t stand a pokey kale either, though. I usually nuke mine for about 2-3 minutes to wilt. Perfect every time. This salad is super delicious! Thank you again for another great recipe! I could hardly wait until May to receive your cookbook! A belly rub for Cookie! After a week of all-the-bread-and-cheese meals, I was excited to have something green. This salad is fantastic! Your recipes are always so flavorful and this one does not disappoint. I added both olives and pepper rings, and the dressing is divine. I did try the rolling pin technique that another reader suggested to really get the kale wilty, and I agree that working with it makes the texture and taste better. Thanks for another awesome recipe! Great! So glad that technique worked out. I’m trying to get the world (aka my friends) to love kale salads as much as i do. I have a few go-tos, and this just became my favorite. Or maybe tied for first, but still. I used feta instead of parmesan because I already had it but other than that I followed the recipe pretty closely. IT’S PERFECT. The creamy tahini mixed with the salty greek flavors is just insane. So so so so happy to have this in my collection. Yes! And good luck with converting your friends into kale-lovers, it shouldn’t take much :) Happy you enjoyed. I usually pass over kale salad recipes because they don’t usually sound good and I’m not a salad-as-a-meal type of girl. This one sounded kind of good and since my 2-year-old daughter loves salads I decided to give it a go. It was so good! I was shocked. I could actually eat it as a meal and not feel gypped. Too bad my daughter and husband didn’t care for it. :/ But what do they know? ; they both eat like 2-year-olds. Your salad is delicious! Thanks Kate! BTW, any tips on buying/stirring tahini? It gets everywhere and I bend spoons trying to stir it. This can was extra troublesome since the can opener didn’t open it all the way and I had to pry the lid off, almost slicing my hand and splashing tahini everywhere. Giselle, so glad you loved this one! I’m sorry the other two didn’t enjoy it (your comment made me chuckle). Whole Foods 365 brand is by far my favorite, but it still settles like the others. I’ve never used a canned variety. You might try storing the tahini jar on its side (on a plate to catch any oil seeping out); I think it is easier to reincorporate that way. I’ve used a number of traditional Middle-Eastern tahini brands, and I think the Soom brand from Ethiopia is by far the best. Very smooth and easy to work with texture, and just needs a quick gentle mixing before using. No hard lumps in the bottom of the container. Recommended by cookbook author and restauranteur Michael Solomonov. I always store tahini in the fridge and it lasts a long time. Kate, this salad is AMAZING! I couldn’t stop gobbling it up. I’m so happy I discovered your blog and, even better, that you’re from Kansas City! Keep the amazing recipes coming! Hey, Lee! So happy to have you here. I hope I converted him for at least one meal :) Thanks, Alexa! I love this salad and have made it a few times for friends and family. It’s always a hit. I skipped the whole step of toasting the sunflower seeds in olive oil. To me, it wasn’t worth dirtying another pan. I’ve toasted the seeds in my toaster oven and I have also thrown them into the salad raw. Both worked ok for me! Whatever you decide to do, this is a really great recipe. Awesome! Happy this fit with your cooking routines! This salad was delicious and the dressing feels like a Caesar dressing! Would love if you provided nutrition info for your recipes, tho. Hey, Sheri. Unfortunately, I don’t have nutritional info available for my recipes just yet. I’m looking for a solution, and will update about it once I find one. Thanks! Made this salad for lunches this week. Super easy to make and soooo delicious!! Can’t wait to try your other recipes! Yes! It keeps so well throughout the week, too. Let me know which others you try! I absolutely LOVED this recipe, particularly the salad dressing. It marries beautifully with the kale. I want to eat it on everything. A friend recommended your blog and I am smitten. It really inspires healthy eating and for someone that enjoys cooking, its very attainable. Loved this salad, absolutely delicious!!!!! This looks good! I’ve just started exploring kale recipes, and I love it. As long as you chop it and massage it, it definitely doesn’t lack flavor, and I like that it’s tough enough to hold up under oil and vinegar instead of wilting. Yes! Kale gets such a bad rap, but if you know how to handle it, it is delicious and SUPER nutritious. Nothing else compares to those dark greens. This is my kind of salad! Can’t wait to try it. I made this salad last night and it was so good!! The tahini dressing is delicious!! This is a great salad and every bit as appetizing and pretty as the photo. Love it! and the dressing is great. Always have a jar of tahini on hand, and now a new dressing recipe! This is great to hear, Ellen! I love the dressing, too. Hello! Quick question – is the 1 TBL of Olive Oil in the dressing? It’s in the ingredient list but doesn’t seem to be in the instructions. Thanks! Oops! Yes, that’s correct. Thank you for pointing out that issue. I just fixed it. I made this salad a few weeks ago for dinner and really enjoyed it. The flavors are different from any other salad I’ve had and it felt really hearty–great for an entree salad. Last week I started daydreaming about these flavors again, but thought I might give it a go with roasted broccoli instead of kale. I ended up throwing a huge handful of fresh spinach in with everything too for a little more “filler”. It looked absolutely beautiful all mixed together, but it didn’t stop me from enjoying my half of it straight out of the big bowl I used to stir it all up. :) Both of these combinations are delicious–I’m excited to have another variation of this salad up my sleeves. Thank you Kate! I can’t get enough of your blog and tell friends, family, and coworkers about it all the time! That variation sounds great, Lauren. I’m so glad you enjoy it! And thank you for spreading the word about C&K! Awesome salad! It’s going to be my new side dish to bring for family gatherings and events. Thank you! I hope they love it, Ava! At the risk of being dramatic, this is the salad to end all salads! I finally made this after having the recipe saved for weeks, and I am sold. Not only is it delicious fresh, it keeps so beautifully with dressing on! This was my first kale salad ever – the only thing I did differently was omit the peppers and substitute pumpkin seeds for sunflower seeds. It would probably be good with a mild feta too. Thank you!!! A little hyperbole never hurt anyone. ;) I’m so glad you love it so much, Sarah! Substantial salad with a powerful flavor punch. This salad, plus a slice of crusty French bread and good olive oil for dipping, made for an incredible meal! Bonus: it held up well overnight in fridge and made for a great dish th next day, too. Hadn’t tried this recipe because of the curly kale but I got two huge bunches in our new CSA this week. I should have known that you could figure out how to tame the curly in kale. Massaged the heck out of it and this salad is soooooo good especially when chilled awhile. Kate I don’t know how you come up with such yummy combinations. This is so boldly flavored and delicious. Craving it again already. Holy cow! I just fixed this and it’s fantastic!!! I love hearing this, Caterina! Thank you so much for reading. I have the best followers on here. Just had this very satisfying salad for dinner — Kate, your recipes are satisfying because of the brilliant combinations of flavors, not just the bulk that fills the tummy. I didn’t have enough pepper rings so I added the olives as well. And I am now a huge fan of sun-dried toms — I found a brand that doesn’t use oil. This is hands down the best kale salad I’ve ever eaten!!! I subbed capers for the olives and it is still exceptional. Will absolutely make again! Thank you for the awesome recipe! Awesome! I’m so glad you love it, Carly. I didn’t actually look at the whole recipe and I think I will try it, since I came back to make the dressing again. I made the dressing and tossed it in my romaine Greek salad with tomatoes and feta. My husband LOVED the dressing. I have to admit, I added a tablespoon more olive oil and tablespoon of ground mustard cause I didn’t have dijon and I love extra oil. I doubled the recipe and blended in my vitamix. It also refrigerates well. With our garden putting out tsunami of kale now, I’m always looking for new ways to use it. This was great! I threw in some blanched green beans just cuz, and they went well with it. I made this to take to a dinner. I knew it was a gamble because, well, it’s kale salad. BUT. I followed your instructions on massaging the kale, and it turned out amazing. I even made my own tahini for the dressing!! I got so many compliments and my stepmom is now checking out your recipes. Even my 6 year old nephew had seconds! I love this salad! I’ve made it several times and I usually end up eating the whole bowl myself — can’t stop and don’t want anything else! But I only feel a little guilty because it is kale! And, as with all of your recipes I’ve tried, it can accommodate quite a bit of substitution, addition, and subtraction depending on what I have in the cupboards and still turn out great (like roasted sweet potatoes for chickpeas, which is my new favorite version!). Thanks again! Thanks for your review, Kathryn! I love recipes that can use what we have around. Those additions sound delicious. I this recipe a few months ago and I must say that it is awesome. It is so tasty, that I make it about 3 times a month. To change it up sometimes, I’ll use the dressing recipe for kale wraps. I massage the kale with the dressing and pair it with roasted red peppers and a garlicky turmeric rice. Yum! Thanks for sharing your delicious recipes as this blog is a go to when looking for something good to prepare. 3 times a month?! That’s great.If you would want to leave a review since you liked it so much, that would be great. I really appreciate it! So delicious! My 12 year old son used to love kale salad but hasn’t enjoyed it lately. He loves this one! It is definitely a crowd pleaser. Thank you for the recipe! I’m glad he liked it enough for this salad! Maybe just what he needed to like Kale again. :) Thanks for sharing, Kami! Perfect for the midsummer foodbox ‘what am I going to do with this kale’ blues. I just made this salad, and it’s fantastic. I love the flavors. Curious about the purpose of the salt on the kale. Does that help it to wilt a little? The salt, plus massaging it between your fingers, helps to break it down and bring out more flavor. Hope this helps! I am not sure what I did wrong with this, but the salad wasn’t one I’d make again.The dressing turned out extremely thick, a very heavy tahini taste, seemed unbalanced. the greens smelled delicious, but for the effort and the expense, I was a bit disappointed. glad it worked for the others. I’m sorry to hear that! It could be the tahini you used. I know some tahini can vary. You can always make it a little less thick by adding a little more water. Thanks for sharing, Maxine! Super delicious! I thought I didn’t like kale- until I tried your salad. What a difference massaging it makes and the toasted sunflower seeds kind of pushed this salad over the top- we were almost fighting for the last bites! Thanks Kate for showing me how to properly prepare kale! Massaging is key! You’re so welcome. I’m glad you love it. I made this last night for a dinner with friends. I am soooo glad there was some leftover, and I had it for breakfast today. Amazing flavors! Thanks so much. I love your tahini sauce recipe it’s so good yet so easy to make! I started adding parsley to the sauce and it works really well. I make a different version of this salad with Kale-Cherry Tomatoes- Hemp Seeds and Avocado with your tahini sauce. It’s a great salad for weight-loss. Thank you for sharing. You’re welcome! Thanks for the review, Tiago. This is slammin’! I LOVE your blog! Really good!!! We love it! Wonderful, Cristine! Thanks for the review. I absolutely love this! I had eaten a kale salad in a local cafe a few times but all I knew about the recipe was that it included mustard. By accident I came across this recipe and thought I´d give it a try. This was about a month ago and today is the 6th time we are eating it, my boyfriend and I absolutely love it. Also made it for a friend who is a picky eater and even she loved it :) A few times I had to swap the tomatoes for peppers, or the chickpeas for adzuki beans but it was a hit every time, once even with some quinoa added. I love to hear that you love this one so much! Thanks for the review, Enja. I thin peppers would work nicely! Hi Kate, I have made this recipe for large family gatherings and occasionally at home for my husband and kids. It’s so delicious! Thank you! I made this and loved it! I didn’t add the pepper rings, but did add regular black olives. And I also toasted the raw sunflower seeds in the oven (plain) instead of in a pan with oil. I made a “test” version this weekend and will definitely be making it again next weekend for my daughter’s extended family birthday party! Great to hear, Christina! Thanks for sharing your take and review.